In the hierarchy of events in a cadet’s 47-month experience, Branch Night is second only to Graduation in importance. For the members of the Class of 2019, Branch Night signals the reality of a life beyond West Point. 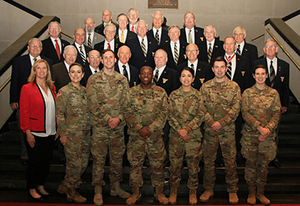 After four years of learning about the 17 branches of the U.S. Army through the various initiatives surrounding the Branch Education and Mentorship Program (e.g. Branch Week, military instruction courses, summer training, etc. ), on that night, November 14, 2018, the firsties finally learned what their identity, beyond “cadet,” will be in the profession of arms for the next five years or more. According to BG Steve Gilland ’90, the 77th Commandant of Cadets, 96 percent of the Class of 2019 received one of their top-5 branch choices, with 77 percent getting their first choice. These numbers reflect a 2018 directive from Army Leadership for USMA to increase the number of graduates serving in combat arms branches to 81 percent, which is a five percent increase from last year’s graduating class and likely the first in a series of increases for USMA’s combat arms branch allocations over the coming years. The members of the Class of 2019 came to West Point to serve their country and the Army, and no matter to which branch they were assigned on Branch Night, they will be doing just that in just several short months. But they need to remember the hierarchy: Branch insignia has no meaning unless it is accompanied by a 2LT gold bar handed out on Graduation. You may also like to read about the U.S. Army’s new Talent Based Branching system. View photos.